This is a new one for me this year, and I'm pretty excited about it! 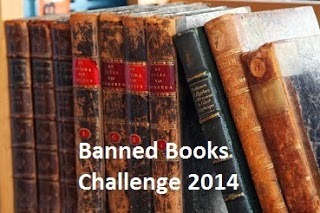 Buckling Bookshelves (great blog name, by the way) is hosting the Banned Books Challenge for the second year. Any book that has been banned or challenged counts towards this challenge. In keeping with my over theme of aiming low in 2014 challenges so that reading challenges don't go from fun to stressful, I'll be starting with the lowest level, Making Waves, which only requires 1 to 2 banned books. But hopefully I'll find a bunch of awesome banned books and move up a level or two over the course of the year. I'll list my banned books below as I read them, and link to the reviews as I write them.